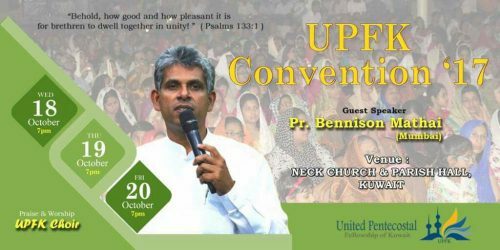 United Pentecostal Fellowship of Kuwait (UPFK) is organizing a MEGA convention at the National Evangelical Church & Parish Hall in Kuwait (NECK) from OCTOBER 18 to 20 (Wednesday to Friday) from 7:00 pm-9:30 pm. UPFK is the united body of main line Pentecostal Churches like Indian Pentecostal Church (IPC), Assemblies of God, Church of God, Sharon Fellowship Church, New India Church of God, PMG etc. Renowned Convention Speaker Pastor BENNISON MATHAY shall preach in this Convention. Enough facilities have been prepared at NECK to accommodate thousands of believers as a large crowd is expected for this unique event in Kuwait. Pastor Abraham George will inaugurate this Convention and UPFK Choir will lead the worship session. Pastor Emmanuel Ghareeb, the Chairman of NECK shall also address the audience. A Souvenir shall be released during this Convention, which carries the long history of the Pentecostal movement in Kuwait for the last 50 years. A vast committee of more than 100 people, including following persons is working with various responsibilities for the smooth arrangement of the convention. Roy K. Yohannan (General Convener), Mathew Daniel (Secretary), Jacob Thomas (Treasurer), Reji T. Zachariah (Joint Treasurer), Shibu V. Sam (Publicity), Pastor Joseph Mathew (Reception/Volunteer), BIJO K. EASO (Transportation), Pastor.Ninan K. George (Prayer), ANIL PHILIP (Choir).